Search for treasures. Discover mysteries. Build a shelter. Survive. Most rules summaries are relatively easy, if time-consuming, to create, but occasionally I come across a rulebook that is so badly written and laid out that I know you’re in for a long and difficult challenge. Robinson Crusoe: Adventure on the Cursed Island has such a rulebook, which leaves the reader completely discombobulated—and the game’s inconsistent graphic design doesn’t help. I’ve worked hard to massage the rules into what I think is a more useable and comprehensible form. Which is a shame, as the game itself is universally praised; and personally I think it’s the best coperative game on the market. Instead of just taking individual turns in pursuit of common victory conditions, you really do carefully plan each turn together, as a group. As you get ready to resolve the results each round, you feel like you’ve been gathering around the campfire and making decisions that will actually affect your survival. It’s a surprisingly visceral experience for a boardgame. 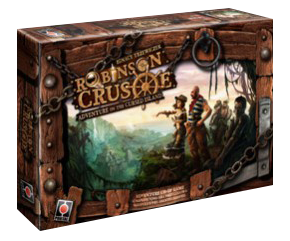 Robinson Crusoe: Adventure on the Cursed Island is by Polish game designer and extremely nice guy Ignacy Trzewiczek (Stronghold, Theseus: The Dark Orbit, Imperial Settlers). It’s an ingenious cooperative game of survival on an island; a sprawling sandbox of a game that, with the help of Scenario cards, can simulate adventures based on everything from King Kong’s Skull Island to Darwin’s Voyage on the HMS Beagle. Thank you for this rules summary. I am going to print them out and give them a try this weekend. Donated! Awesome job. I’ll finally start getting this to the table as a solo game more often than I have been. Now everyone pile in the donations so we can convince UH to make us rules summary for Mage Knight! Ah, sorry to hear that. Yeah I guess you aren’t that into heavier games, come to think of it. At least by looking at the types of games you tend to feature on your site. Well, if I ever decide to try and take a stab at it, I hope you don’t mind if I copy your style and try to make a similar looking template for Mage Knight and Twilight Imperium. Thanks again for all your efforts. Ah no hard feelings. Different strokes I guess. I think one of the reasons it felt so natural to me is all the time I spent as a Magic: The Gathering player, so I kind of felt right at home with most of the concepts. But I also think I have a tendency to enjoy games that many others feel are “klunky”. My #1 favorite is Archipelago which a lot of people find to be a big klunky mess. Come to think of it, I remember you being a fan of Earth Reborn, which a lot of people have a hard time with as well, so I’m sure you can relate in some respect, even if not with MK in particular. No big deal though. The bottom line is that I appreciate the effort you put into your summaries and other projects. I think at least 30+ of the games on my shelf have nice laminated summaries inside the boxes, and I use them a lot. Twilight Imperium is my favorite game EVER! I only play it once or if I’m lucky twice a year, if that. I would totally donate for that one! Great job on everything you do! That’s too bad! I thought that if anyone could make Mage Knight intelligible, it was you. Maybe if you gave it another go. I’ve got to tell you, I bought Mage Knight and was thoroughly disappointed initially, but after a few plays, I really started to like it. Its my buddy’s favorite game, so we would play it from time to time. I’ve been keeping my fingers crossed that you would do that one, too. Is it possible that if enough people requested it, you would reconsider? Thanks for this! Now all I need is a Mage Knight player aid and my life will be complete! MIles (sorry, the reply threading only seems to go so far). I sympathise with doing those cavalry, they were a bugger! Glad you’re enjoying the site and the summaries. I’ve played many times and I’m still confused about this. – I feel Variants, Skills, Other Rules and Invention Cards should be on the same sheet instead of for each player. – Why is the round summary on two pages instead of one? To save space on the table? – Have you thought of putting the version number of the help on every page in very small font size so we know which version we have printed? Forgot to mention: I make remarks because I care not to dismiss your work, you know that! Thanks gamov, I appreciate your comments very much and I’ll go through them all in detail soon. Just a couple of quick points – the amount of detail on the reference sheet is just a decision on my part; it could be simplified but I wanted to get everything essential on one (albeit double-sided) small sheet. As for the version number on the sheets in small type, I once did this for a short while but unfortunately I had a tendency to forget to update it, so I scrapped the idea. Update logs on the game pages should help you to track different versions if necessary. Hi, what weight paper stock do you recommend for printing these out? I used to use a double sided heavyweight matt stock, print both sides, and laminate it, but now I use glossy photo paper (250gsm), print the sides separately and glue them together with spray adhesive. Can’t thank you enough for this. It’s one of my favoutire co-ops ever, and this makes everything so much more clear. I used to have a hard time explaining this to players and keeping track of everything, but this is EXACTLY what I wanted. yay! Great guide! Just printed them off and used in my first game the other day. What a time saver. You mention Darwin’s voyage in your description above, but I do not see any reference to the expansion in your sheets. Is there a plan to add those in? Some parts of the expansion are universal (such as the Missionary character, some of the additional event cards, and the extra side-characters like the parrot, boy, horse). I have the expansion but haven’t had a chance to incorporate it yet. It will happen eventually! In the black&white version, in the Setup portion of the guide, the Hungry animals die doesn’t show any pictures, just black boxes for all three possibilities. Otherwise looked really solid, liked it a lot. Good to hand out to people who are playing for the first time to skim through quickly while I setup the game. Just bought the first edition and I was aware that the rule book was a mess. Gonna solo the game tonight with your revised rules. Great resource thanks. I only donated a small amount but I suppose every little helps. Keep up the good work. Thanks Jamie, every little bit is appreciated. Great work – I guess this also applies to the 2nd edition? I’m not sure, I don’t have 2nd edition and I don’t know what, if anything, as been changed. 1. Gathering and exploration are no longer limited to being performed one tile away from camp. The cost in pawns increases by one for every additional tile/space between camp and the target. 2. When building your personal invention, the bonus of two determination tokens may be taken again if/when the invention is rebuilt in future rounds. The bonus is no longer limited to only the first time you build the personal invention. 3. Exhausted resource spaces do not produce resources, even if there is a +1 token on the space. +1 tokens have no effect for an exhausted resource on that space. The (vastly improved) rulebook for the new edition is available for free download on Portal’s website, so you don’t need to buy a new edition to get access to the new rules and update your summaries. Thanks so much for producing these! Thanks Sam—now all I need is the time! 🙂 I’ll put it on the to do list.